Keeping track of your house keys, car keys and work keys can be something of a chore in modern life. 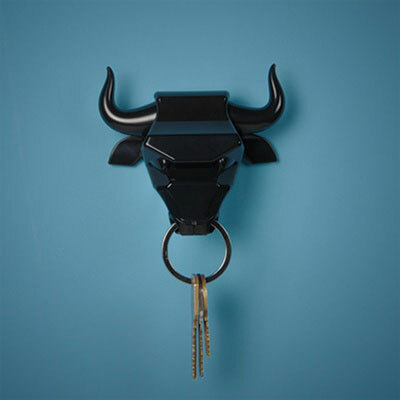 Now Gama Go brings a bit of matador style to managing your key mess – your very own bull complete with nose ring. Each magnetic bull head comes with a properly sized keyring which clips into the nose, looking cool and keeping your keys handy and visible. No more lost keys when you place them in the septum of your bull. Choose a bullock in black or red, both colors look tough and horny. Riffing on the iconic septum ring associated with the handling of powerful and unpredictable bulls, nose rings have been used for controlling animals since the dawn or recorded civilization.